Swedish immigrant Axel Stone was working as a watchman aboard the one-year-old steamer Vernon when the vessel foundered in a fierce Lake Michigan gale on Oct. 25, 1887. The 23-year-old Stone became the only one of an estimated 30 to 40 passengers and crew members to survive the disaster. To do it, he miraculously stayed alive on an open raft for two horrible days. His story is among the best in the chronicles of Great Lakes shipwreck lore. He said the ship was lost because it was overloaded with cargo that was packed so tightly it made it impossible to close the upper half of the top hinged forward gangway hatches. In those days, cargo was loaded through hatches on the side of the ships instead of through deck hatches, so leaving them open was inviting trouble in the event of rough weather. And trouble was waiting on the open waters of Lake Michigan. 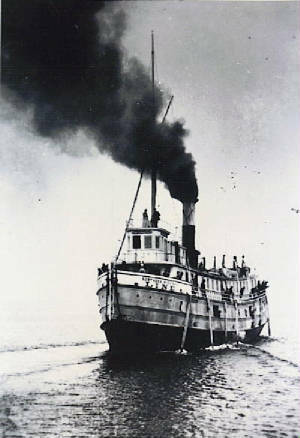 The Vernon, under the command of Captain George Thorpe, 30, a New York native, was steaming from Mackinaw City to Chicago with various stops in port towns along the way. Her last stop was at the Michigan towns of Glen Haven and Frankfort before heading out across the lake toward Chicago. The Vernon was Thorpe’s first command. The cargo included 400 boxes of fish, 90 tons of pig iron, barrels of apples and potatoes, bundles of barrel staves and general merchandise, all of it packed so tightly that the fore-to-aft passageway on the main deck was blocked. Stone said the ship was so heavily laden that less than six inches of freeboard remained above the side-loading gangway hatches. He said he was on deck watch until midnight as the storm that sank the Vernon started to build. He said the seas were soon causing the ship to fill and the pumps were running at full throttle to remove it. When reporting this problem to Captain Thorpe, Stone said he suggested that cargo be jettisoned so the forward hatches could be closed. But the skipper would not take the advice of a subordinate crewman. He told Stone to go to hell. Thorpe assured Stone that the Vernon was be save in Manitowoc Harbor within the next few hours. When Stone left watch around midnight he went to his bunk and tried to sleep. At about 3 a.m. he said he was tossed out of his bed when the ship was thrown on its beam ends by a massive wave. At the same time he said he heard ominous crunching sounds and erratic activity on deck. Stone said he opened his cabin door and was hit by a flood of water. He forced his door closed again and began to prepare for the horrors he knew awaited everybody on the ship. He put on his warmest clothes, donned a life preserver, then he jumped through his cabin window and dropped directly into the raging lake. Once in the water, he said he could see that the ship was lying in the trough of the sea and was sinking. Only one of the four lifeboats on the ship was launched before the Vernon foundered. Also part of the wooden superstructure broke away and floated off with several people clinging to it. But this structure broke apart and one-by-one the victims on it disappeared. Stone said he spotted a life raft in the water and swam to it. On the raft were seven other crew members. The others told him how the storm battered the aft gangway hatches open, flooded the engine room and put out the fires. Without steam the ship lost headway and fell into the trough of the seas. Also the pumps were stopped. It foundered soon afterward. That Stone foresaw the danger and took the time to dress in warm clothes probably saved his life. He said he was wearing breeches, blouse, heavy shirt, a coat and shoes. Because the ship sank in the night, while most crew members and passengers were caught in their bunks, they fled in their night clothes. One-by-one they perished from the elements. The irony was that the lights of Manitowoc could be seen from the raft. The survivors were only 12 miles away. But they were being hit by heavy seas and an icy spray that quickly took their toll. By dawn only Stone and the lifeless body of a fireman remained on the raft. The rest had been washed away to perish in the seas. Stone said he was determined to survive the ordeal. He kept active by rowing the raft toward shore. When he realized he couldn’t make any headway against the offshore winds, he maintained consciousness by crawling around on the raft and constantly moving. Sadly, Stone said a number of passing ships came upon the drifting wreckage of the Vernon but failed to stop and look for survivors. Some passed so close that he said he could see the faces of the people on their decks. It was not until about 4 a.m. the following day, about 49 hours after he first entered the water, that the steamer Pomeroy stopped at the scene. The ship got so close it actually bumped the raft. Stone’s calls were easily heard by the Pomeroy’s deck watchman and he was taken aboard. Stone’s story was confirmed in 1969 when sport divers found the remains of the Vernon. They reported that the ship was clearly laden with cargo and that the gangway hatch doors were open.